The University’s opera performance is a major event each spring because the concert is a large collaborative effort between different areas within the APSU music department. The cast includes vocal performance majors, while the APSU orchestra performs in the pit under the direction of (APSU professor music and symphony conductor) Dr. Gregory Wolynec. A performance in two parts, the opera offers two views on relationships: the first being a prologue which offers a contemporary take on relationships featuring songs from a variety of time periods, styles and mindsets. The second part is a period piece opera that offers a historical perspective on the same timeless issues. The two acts are tied together by setting the prologue at a theatre that is performing Rossini’s opera, “La Cambiale di Matrimonio,” in which the performers play the parts of operagoers. Featuring unique production design, the stage creates a theatre space in which “Cambiale” is taking place within a small dinner-theatre style opera house — complete with a grand drape and elevated stage. Kyra Bishop, Conklin-Bishop’s daughter, designed the set, while Conklin-Bishop’s father, Ralph Conklin and her husband, Rick Bishop, built the set. “La Cambiale di Matrimonio” was Rossini’s first professional opera, written in 1810, when he was just eighteen. 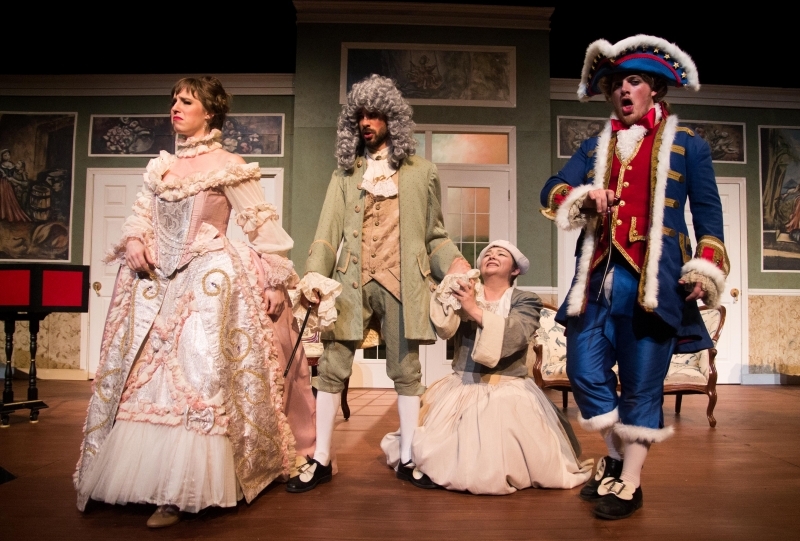 The story offers a comic view of marriage in the 18th century. Rossini’s work is an early example of an era in operatic history known as bel canto, or “beautiful singing,” in which voices display technical agility and virtuosic skill. The opera itself is entirely in Italian, and Conklin-Bishop said that that presents a challenge that will allow the ensemble to demonstrate their abilities on the biggest stage of their season. The opera opens at 7:30pm on Saturday, April 11th, with a matinee performance at 3:00pm on April 12th, in the Music/Mass Communication Building’s Mabry Concert Hall. Tickets for “La Cambiale di Matrimonio” are $10.00 for adults, $5.00 for students and free for APSU students with a valid I.D. For more information on the show, contact the APSU music department at 931.221.7818.